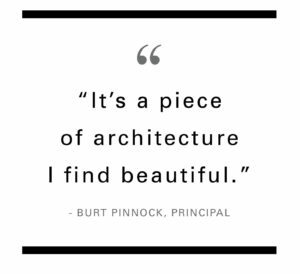 Not unlike most architects, Principal Burt Pinnock’s desk is an assortment of creative chaos. But if you sift through the highlighters, reference books, rulers, and remnants of current project work, you’ll find an orderly stack of sketches representing the buildings not often talked about. “All ideas, all unbuilt,” says Burt. There’s no one reason why a conceptual design doesn’t carry through to completion. Funding falls through, ownership changes, permit snafus occur, visions change. Rather than getting down in the dumps on what could have been, our philosophy is to celebrate conceptual efforts for what they are: creative exercises that shape us as designers and inform the buildings that do come to life. So we’re dipping into the Baskervill archives to give you a brief glimpse at some of our favorite unbuilt works and the stories behind each. The very first is near and dear to Burt’s heart, a visual culmination of more than a decade’s worth of research. Though this museum physically links the Richmond Slave Trail to nearby slavery burial grounds and historic sites within Shockoe Bottom, at its core, it seeks to emotionally connect visitors to a weighty chapter of Richmond’s history. Rich with symbolism, the design acts as a refuge for visitors and locals alike to contemplate and reflect. Using simple and direct materials, the museum’s architecture literally reflects these togunas. 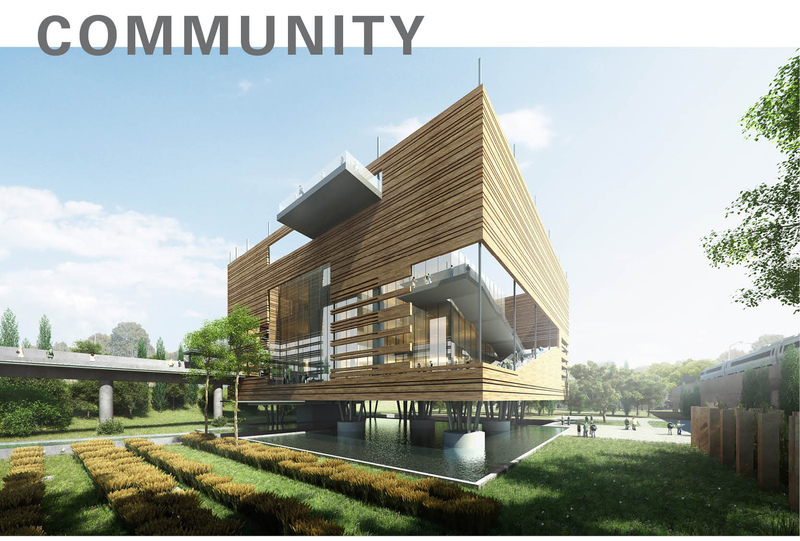 The overall form of the building is meant to symbolize a humble crown, which was further elevated to functionally support the museum’s flood-plain location and close proximity to burial grounds. When rejuvenating entire city blocks of urban streetscape with mixed-use magic, the spaces between buildings are just as important as the structures themselves. Where are natural places to stop and gather? What opportunities exist for fast-paced exploration? 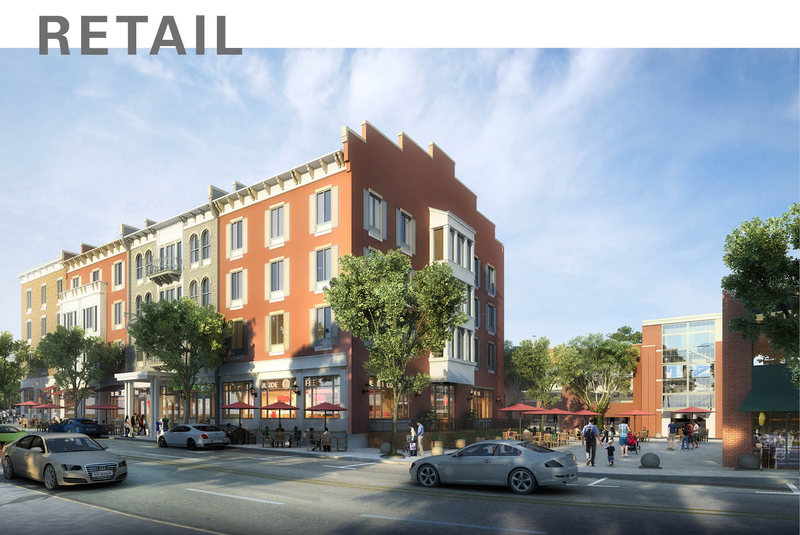 How do we seamlessly transition from pockets of commercial buildings to residential areas? And, of course, how does accessible parking fit in? This was the task at hand as we master planned the transformation of a sleepy downtown corridor into a thriving thoroughfare. “We wanted the complex to feel as if it had been built over time—much the way real towns and communities develop,” says Principal Lewis Goetz, who led the initiative out of our DC office. The first step was building a foundational design vocabulary to tie together two separate city blocks—with proportions, patterns, and materials based on different architectural styles of the period. Next, the team had to pepper in all the placemaking elements that are needed for people to connect with and experience an area, including outdoor green space, water features, lighting, public art, and wayfinding signage. This workspace reimagining for a Fortune 500 giant was fueled solely on strong coffee and sheer creativity. 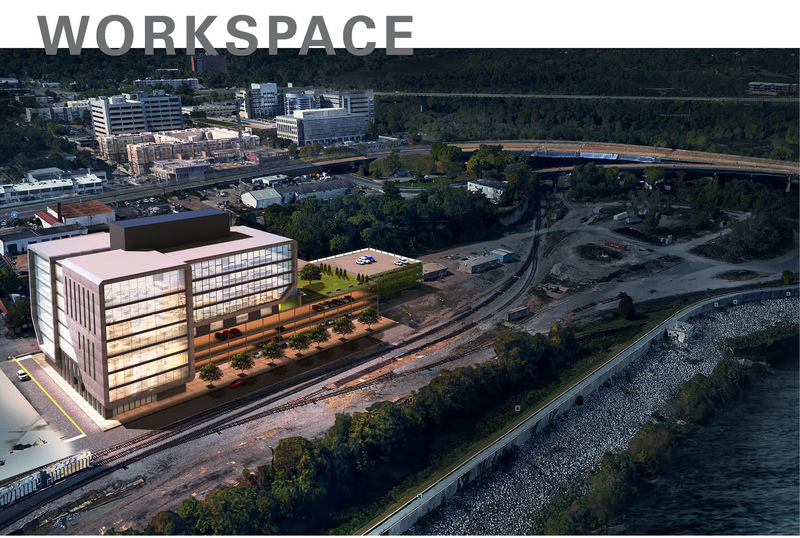 Asked to envision a headquarters without taking parameters such as budget or zoning laws into consideration, Project Designer Tim Hamnett was able to push the design to the edges of possibility. “When that happens, you really have to trust your gut and let a site speak to you,” he says. Because of the sheer size and scale of this project, the first hurdle was finding the right balance between depicting the mass of the headquarters and details that would bring it to life. So he broke the building into three sections and began to play with distinct iterations of form, shape, and perspectives of movement. That’s when it all came together. Numerous curved edges mimic the river’s path and flow. An expansive glass curtain wall gives passersby a glimpse at inside activity while also giving a nod to the company’s core value of transparency. The rest of the façade sports aluminum paneling and a painted-brick base—material choices that evoke both the site’s past as an industrial hub and its future as a lively commercial district. With miles of beaches packed full of hotels, motels, and restaurants vying for the attention (and dollars) of tourists, oceanfront cities are in an endless state of redevelopment—and this particular seaside city is no different, having gone through multiple rounds of reinvention in the last decade alone. What remains elusive? Luxe accommodations with a modern edge. 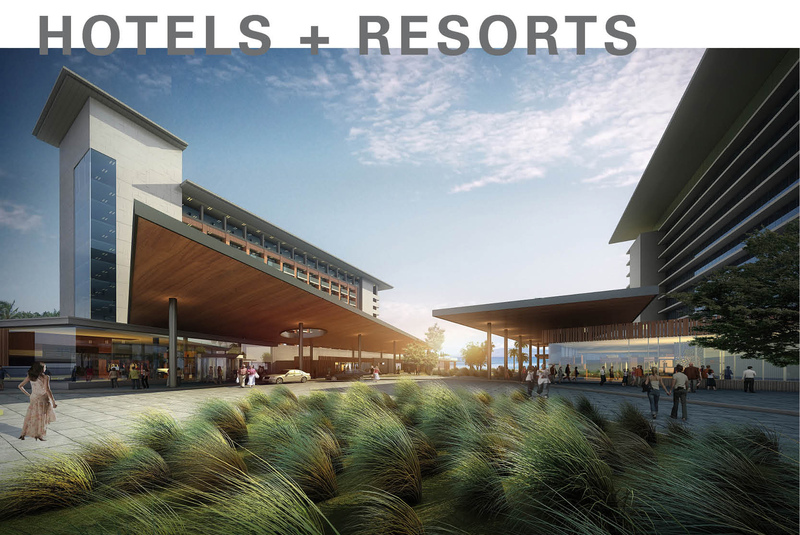 At least, that was the case when we developed this resort-styled concept to shake things up near a renowned historic hotel by the boardwalk. “Every design decision was about showcasing the marvelous views, celebrating these seaside moments,” says Associate and Senior Interior Designer Beth Temple. Even the subtle angling and orientation of the buildings direct attention to the ocean. The spirit of the exterior scheme—a walkable and connected community with an urban feel—was the core inspiration for the interiors. Sophisticated materials mingle with nods to the beach locale, playing up the proximity to the boardwalk with plank-styled applications of warm woods throughout. 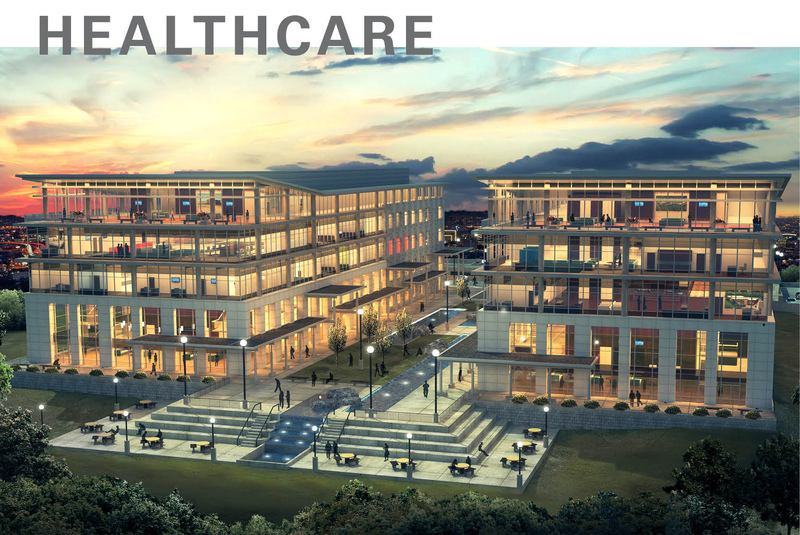 Realistic details and artistic touches—like setting a building against an early evening glow or populating the outdoor plaza with people—culminate to capture the spirit of what a building could be, the intangible qualities we seek to experience within our built environment. Too much realism, however, and you run the risk of clients getting lost in the details: Why those materiality choices? Can we move the outdoor seating? Why is there a window here? Conceptual renderings are first and foremost a tool, a malleable snapshot of the building as a work in progress. Creating one is a delicate balancing act that requires constant practice. That’s why Perritt continues to hone his craft, and it’s this rendering he turns to whenever he wants to try out new visualization technologies and techniques. This is the canvas he keeps painting over and refining. “It’s really taken on a life of its own, far outside of the original conceptual effort,” he says. What you’re seeing is only one iteration of many over the years. “It’s amazing to compare my older versions to the newer ones,” chuckles Perritt. We can’t predict when a conceptual design will stall out, or when a project will shift gears and evolve into something unexpected. 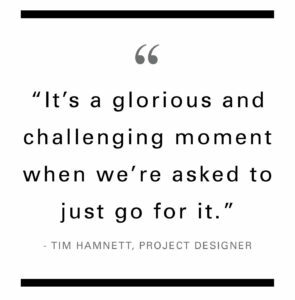 We can, like Perritt, continue to hone our craft—to test and iterate on ideas past, unlocking the potential of each until it transforms into a perfect final draft: a tailor-made solution to a yet unknown design problem.